There are two forms of myositis. 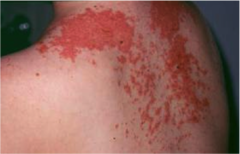 These include polymyositis and dermatomyositis. Myositis commonly affecting older women. Both cases of myositis ( polymyositis and dermatomyositis) may present with raised level of aldolase,raise creatine kinase, the present of anti - Jo-1 antibodies and positive ANA. Immunological reaction has been postulated in as the cause of myositis. Polymyositis is associated with CD8 T cell action which lead to injury to the myofibers. There will be muscle cells necrosis and lymphocytic cells in the endomysium. Patient with polymyositis may complain with progressive and gradual weakness of the proximal muscle with muscular contracture and late muscle atrophy. Dermatomyositis is associated with necrosis and atrophic of the muscle fibers. There will be inflammatory infiltrate in the perivascular region and perimysial connective tissue of the muscle fiber. There is also a decrease in the number of the intramuscular capillaries due to vascular endothelial fibrosis. Dermatomyositis may present with shawl sign / erythema over the back, upper chest, shoulder, face and neck, red rash in malar distribution, periorbital edema, Gottron papules / scaly patches over the metacarpophalangeal joint and interphalangeal joints and purplish suffusion over the eyelid/ heliotrope rash. The treatment will focus on intravenous immunoglobulin and corticosteroid.